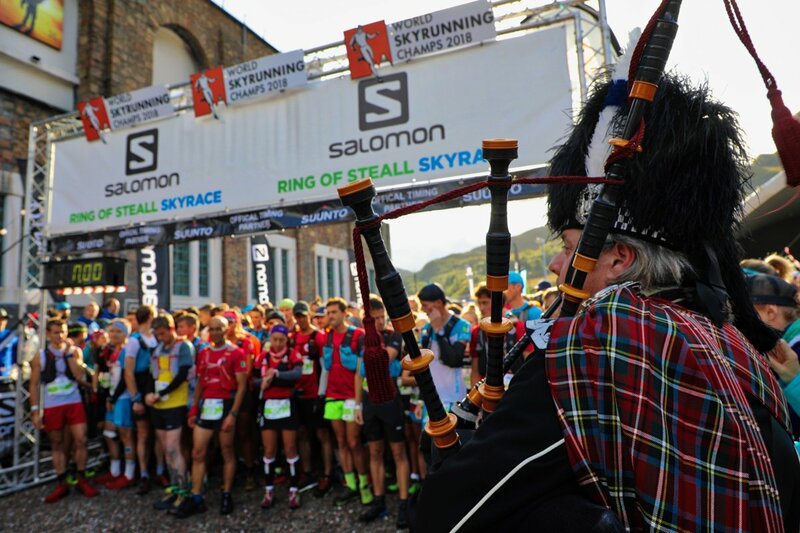 The 2018 Ring of Steall Skyrace, run on a technical 29-kilometer (18-mile) route bearing 2,500 meters (8,200 feet) of elevation gain in the Scottish Highlands, was the site of both the Skyrunning World Championships in the Sky discipline as well as race number five and final qualifying race in the Golden Trail Series, so the ten women and men qualifying for the final in South Africa are now set. Under cool but relatively fair skies at low altitudes and in the clouds up on the ridgetops (for the leaders, as it rained later in the day) Sweden’s Tove Alexandersson, already one of the world’s best at orienteering, broke out big in mountain running to win the stacked women’s race, and Spain’s Kilian Jornet added another win to his lengthy 2018 victory list. Read on to find out how the rest of the race unfolded. Wow! 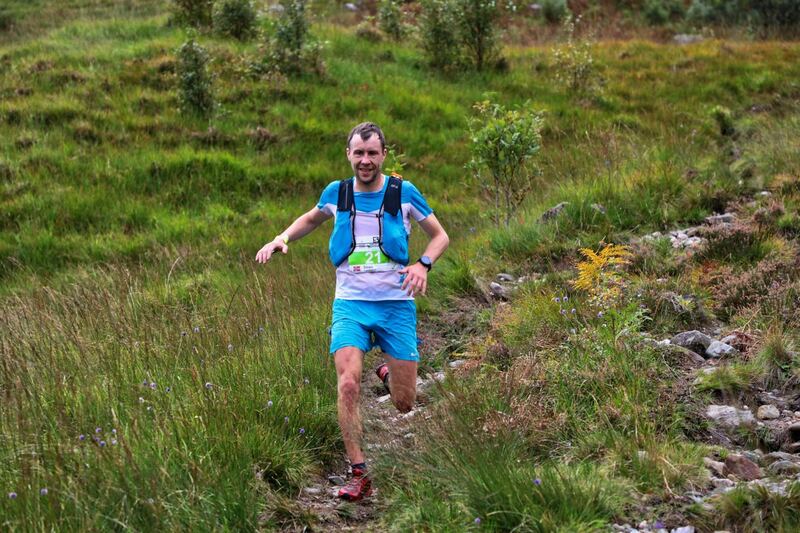 We just covered three wildly different races across Europe over the course of three weekends. If you like what we’re doing, please consider becoming a monthly supporter of iRunFar on Patreon. Your support helps make iRunFar happen. Thank you! This was an absolutely stacked field, with the entrants lists filled with women who had won a lot of different kinds of races all over the world. But the Ring of Steall is not just any race, with its highly technical, muddy, and lots-of-elevation-change course, so the winner would be someone with a specific and particular skill set. The women’s race went out fast, really fast. A group of four women, with a fifth just a few seconds behind, arrived in first together at the five-kilometer point. This group included Sweden’s Lina El Kott, Spain’s Laura Orgué (pre-race interview), England’s Victoria Wilkinson (post-race interview), and Sweden’s Tove Alexandersson. The lonely runner just behind at this point was Spain’s Sheila Avilés. After a two-minute gap, it was England’s Holly Page (pre-race interview), Spain’s Sandra Sevillano, Japan’s Takako Takamura, Italy’s Silvia Rampazzo, and France’s Céline Lafaye all basically together. Sweden’s Sanna El Kott was not far away. At this point, all of the runners looked great. 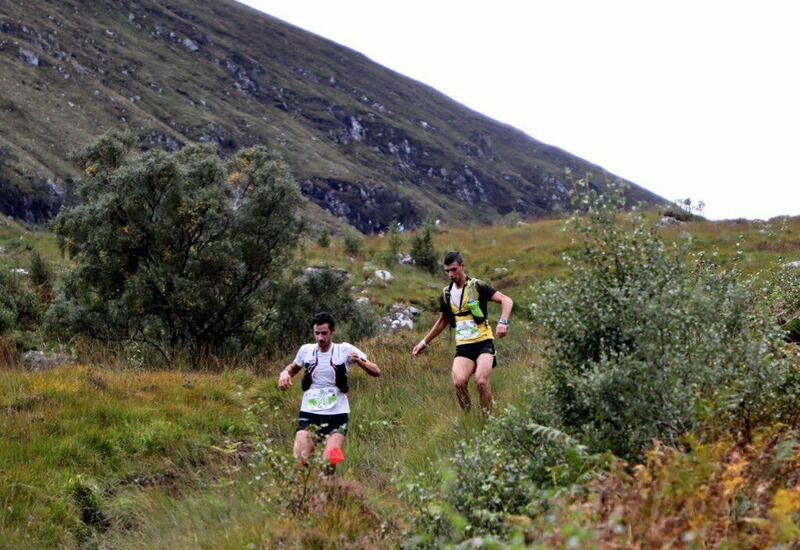 The big climb, ridge run, and wicked downhill to the 12k mark, down in Glen Nevis, broke the field up quite a bit. A hard-charging Alexandersson, a multi-time orienteering and ski-orienteering world champion, now had a two-minute lead in front of everyone else. In a field of world-class athletes, was she truly in her own class today? Time–and some more kilometers–would tell. Avilés ran in second there while Wilkinson held steady in third. A bit further back was Page in fourth, Orgué in fifth, and a pack of six women running mostly together including Lafaye, Sevillano, Lina El Kott, the USA’s Denali Foldager-Strabel, Takamura, and Rampazzo. Tove Alexandersson, 2018 Ring of Steall Skyrace Champion. Indeed, Alexandersson would keep on charging, continuing to put distance on her rivals, absolutely flying down the hill at the 24k mark. 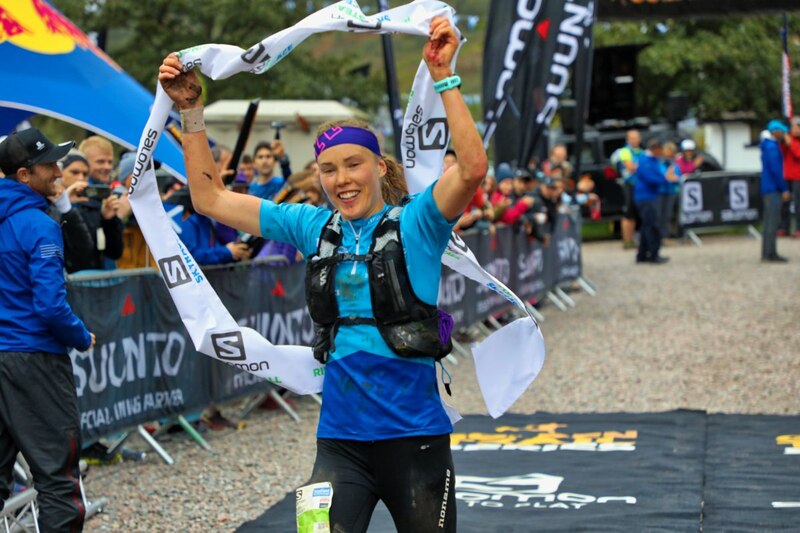 By the finish, she’d destroyed the old course record by almost 20 minutes to win the 2018 Ring of Steall Skyrace and become the Syrunning World Champion in the Sky distance. Along the way, she fell and cut her left hand badly. Wilkinson used her local experience in these sorts of races to move up on the field and finish second, though she finished some 7.5 minutes back from the winner. Page nailed the last part of the race, showing that her good season is still on, to finish third. Victoria Wilkinson on her way to second place. Avilés ran way faster than her time here last year to finish fourth, despite falling and gashing her leg pretty good. Orgué ran under her own course record and finished fifth. Sweden’s Fanny Borgström had a great second half of the race to finish sixth. These top-six women all ran under the old course record! Then, Sevillano finished in seventh place, Lafaye in eighth, Spain’s Oihana Azkorbebeitia moved up late to take ninth, and Takamura rounded the women’s top 10. 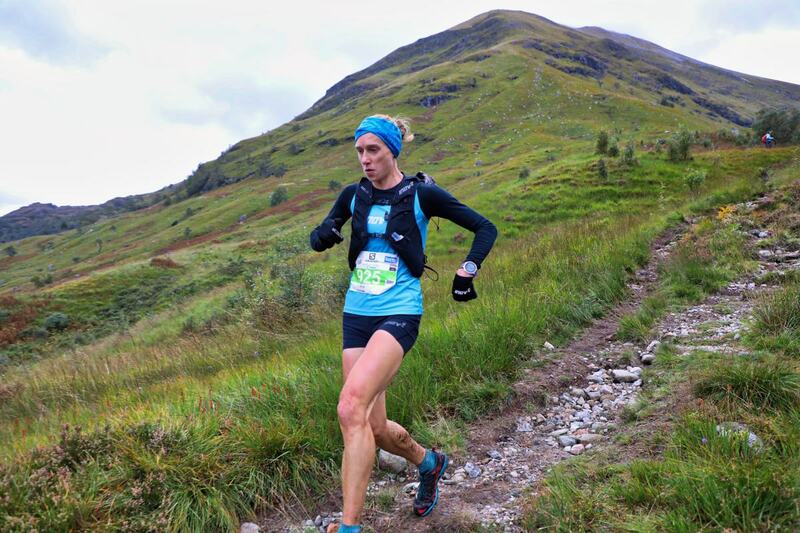 Holly Page would take third at the 2018 Ring of Steall Skyrace. As we previewed, it was going to be a competitive men’s race. Unsurprisingly, the leading train at five kilometers into the race was packed, and headed by Switzerland’s Rémi Bonnet. Running right with him, though, were Spain’s Kilian Jornet (post-race interview) and Italy’s Nadir Maguet (post-race interview). Just a few seconds back, the rest of the wagons included England’s Sebastian Batchelor, Switzerland’s Pascal Egli, Poland’s Bartłomiej Przedwojewski, France’s Alexis Sévennec, the USA’s Sage Canaday, and Spain’s Aritz Egea. And there were probably 10 more guys within just a few seconds. 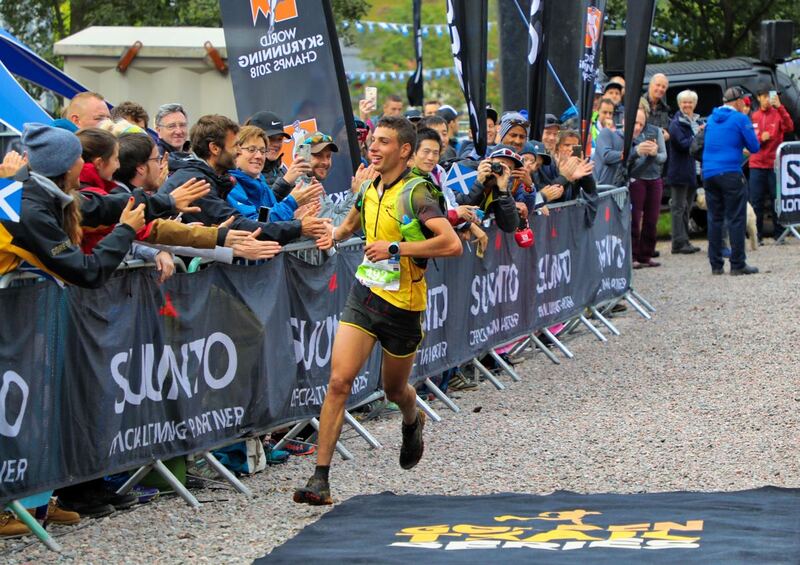 Kilian Jornet and Nadir Maguet leading the 2018 Ring of Steall Skyrace together. It wasn’t until the first big ridgeline that things started to split up. 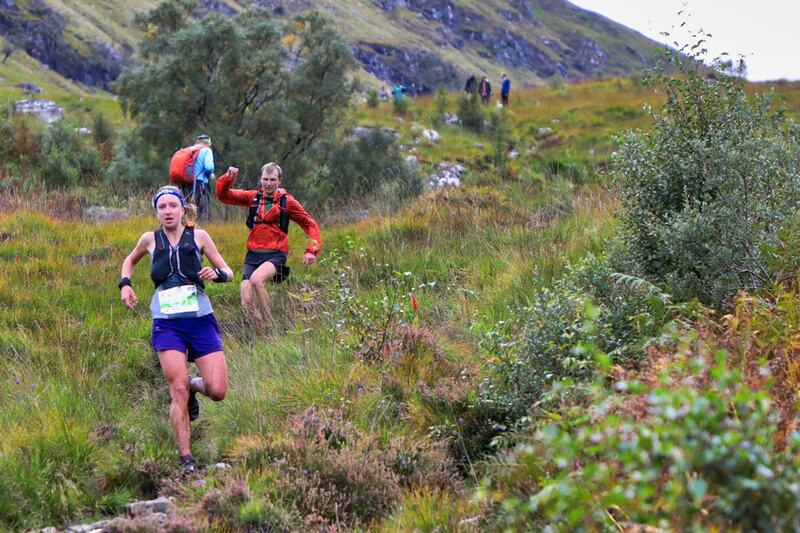 Down in Glen Nevis, 12k into the race, Jornet and Maguet had taken the joint lead, were pushing each other, and had gapped the rest of the field. The next group, over two minutes back, included Egli, Przedwojewski, and Sévennec. Running alone there, probably a minute back from that chase pack, but looking well was the last edition’s champion and course-record holder, Norway’s Stian Angermund-Vik (pre-race interview). Bonnet had fallen to seventh place, Switzerland’s Marc Lauenstein and Spain’s Oriol Cardona were eighth and ninth, and Batchelor rounded out the top 10. 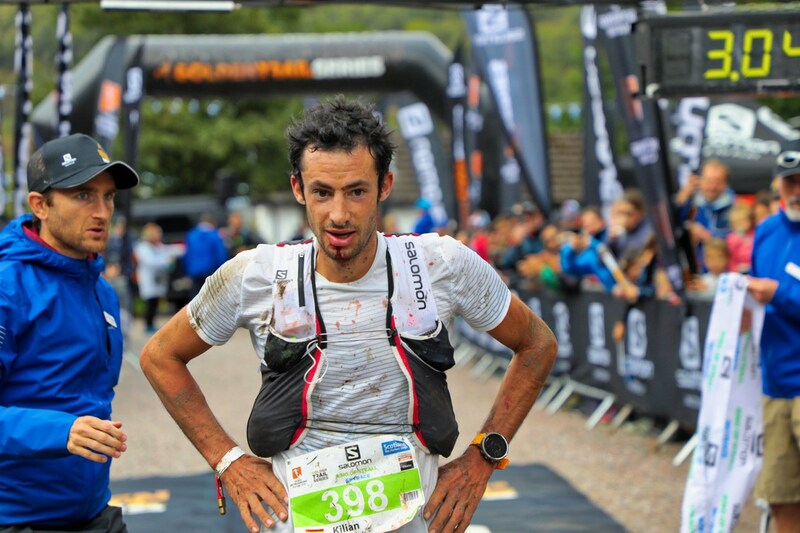 Kilian Jornet, 2018 Ring of Steall Skyrace Champion. On the last descent, with around 5k to go, we spotted Jornet looking over his shoulder, trying to see if Maguet was still there. And he was. Just a couple steps behind him, in fact. From there, Jornet made a final attack to cross the line in first, smash the course record by 20 minutes, and earn the 2018 Skyrunning World Champion title in the Sky division. With some blood on his chin at the finish line but not at the 5k-to-go point, Jornet would later say he took a tumble at the end–he’s fine, though. Maguet was second as he finished just over a minute behind Jornet in an incredible breakout race for him. Angermund-Vik kept moving up in the field, finishing in third, looking like he was enjoying himself the whole way. Nadir Maguet celebrates his second-place finish. Sévennec sprinted on the last descent with Egli, the duo claiming fourth and fifth, respectively. Przedwojewski was sixth, the Swiss guys Bonnet and Lauenstein ended up seventh and eighth, Batchelor was ninth, and Spain’s Jan Margarit squeezed into the top 10. Incredibly, all top-10 men–top 11 to be precise–ran under the old course record. Stian Angermund-Vik on his way to third place. Thanks to Mauri Pagliacci for his on-the-ground support before, during, and after the race! Did Killian just win two races on two consecutive days??? Only two weeks after UTMB! I know he did not finish, but was that his plan had he finished?? My goodness…and 20min off the course record as well. I’d love to know what’s he made out of…I can accept people being talented, strong, fast etc…but he seems to be able to do it day after day, and be the worlds best day after day. Most times the worlds best at any sport built up to a specific event or day or tournament. Kilian just keeps going and going and going…I feel tired just reading his race schedule. Fun to watch though. I have a buddy who ran UTMB…he’s an excellent runner, places high in most races that are local. He’s still struggling to run a slow steady flat pace after UTMB. I suspect that Kilian’s lifetime of using very active recovery rather than rest (except when absolutely necessary) is a major, perhaps the biggest factor in his ability to perform so frequently. avoidance of super intense event-specific training as well. What happened to Dakota Jones? Saw pic of him on starting line. According to him, (to paraphrase) he just didn’t have it from the start. Can someone elaborate on that race in South Africa? How is that related to the series? Who qualified? First x-%? 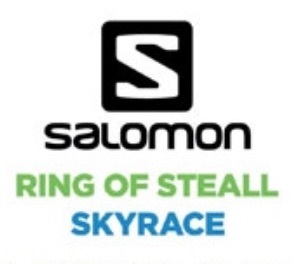 When is that and is Kilian also running that race? Thanks a lot for the continuous coverage! The race is on October 20th. The final is the Otter Trail, a famous South African trail race. Just as in the previous five Golden Trail Series events, there’ll be other participants in the event. The ten women and men who qualified get a sizable assistance package for them and a friend to get down to South Africa.